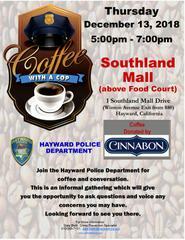 Join the Hayward Police Department for coffee and conversation. We will be inside Southland Mall (above the Food Court). CINNABON WILL GRACIOUSLY DONATE COFFEE!